Elite Model Management is consistently discovering the stars of tomorrow and launching the careers of young models dreaming of becoming one of the glamorous few represented by the most prestigious modelling agency in the world. For the 11th consecutive year, The Elite team held various street scouting around Nigeria and toured Abuja, Port Harcourt and Delta State offering a unique springboard to the girls and boys who dream of becoming models. The Elite Model Look team would be holding it’s 11th National Casting on the 14th of July at The Eko Hotel and Suites, Lagos, Nigeria. A select jury of industry professionals, including a representative from Elite Model Look worldwide, will judge the contestants. 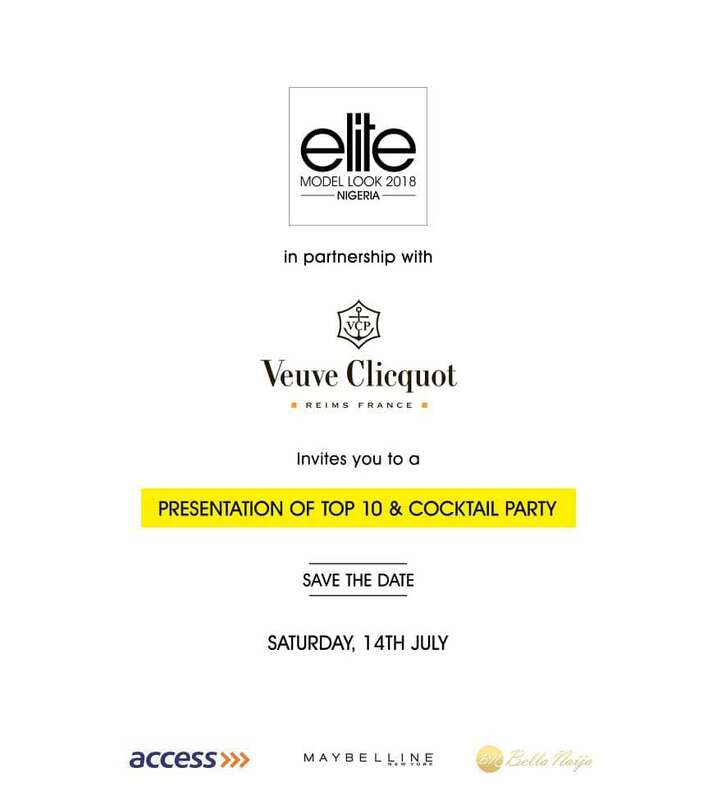 That evening, Elite Model Look in partnership with Veuve Clicquot will be having a presentation and cocktail party to announce the Elite Model Look Nigeria 2018 winners. Each finalist will have the chance to capture the attention of the jury. The goal is not to find perfection, but individuality. At its core, the Elite Model Look contest gives participants vital tools to unlock their own potential, enabling each girl and boy to find their unique charisma and talents, setting them apart as models. The Elite Model Look contest has discovered some of the most recognizable names in the industry, such as Cindy Crawford, Gisele Bündchen, Mayowa Nicholas, Davidson Obennebo and Victor Ndigwe. At the end of the day, the jury will select two winners; a boy and a girl. The Elite Model Look Nigeria winners, get to represent Nigeria at the Elite Model Look World finals, an all-expense paid trip to the world finals and a modelling contract with Beth Model Management! 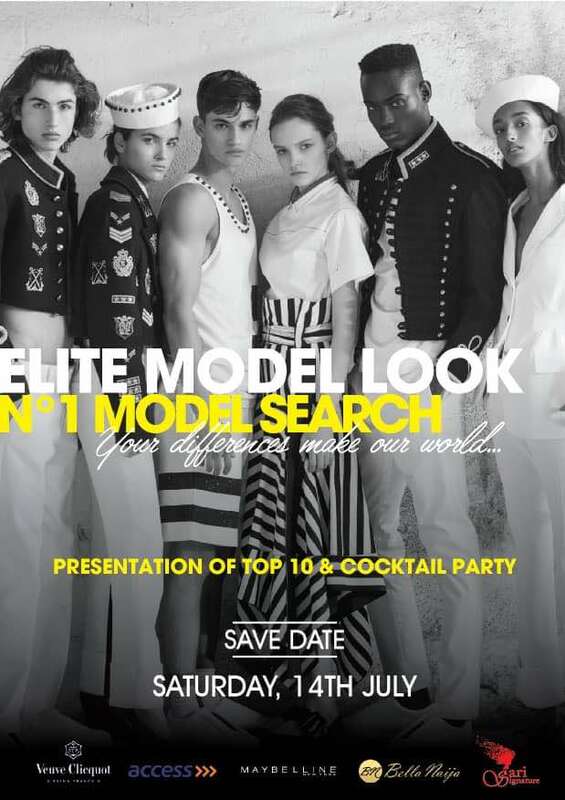 They will join the other National winners worldwide and will participate in the prestigious Elite Model Look World Final taking place in Europe, with hopes of following in the footsteps of Fei Fei Sun, Ruth Bell, Vittoria Ceretti, Greta Varlese, Benjamin Benedek, Mayowa Nicholas, Victor Ndigwe and Davidson Obennebo all discovered by the Elite Model Look contest and propelled to fame. Only a select Elite guest will attend the finale presentation. ELITE MODEL LOOK NIGERIA IS SPONSORED BY VEUVE CLICQUOT, ACCESS BANK, MAYBELLINE, AND SARI’S SIGNATURE, BELLA NAIJA STYLE.